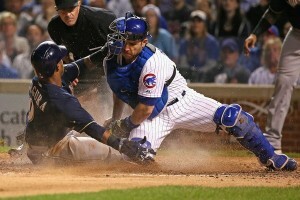 The Chicago Cubs are on the road after a loss on Sunday to Pittsburg. On Tuesday May 17th, 2016 they face the Milwaukee Brewers in Miller Park. Chicago has had an impressive season so far, leading the National League Central Division 27-9 and an equally remarkable winning percentage of 0.750. The loss on Sunday was surely a blow and one can’t help but wonder; given the franchise history could this mean the beginning of the end? The Brewers on the other hand have been struggling this entire season and their strategy right now seems to be do well enough as to avoid falling to the bottom of the barrel. So let’s analyze the match up for this game 1 of the series. Starting for the Cubs is Kyle Hendricks, so far this season his ERA is 3.03; a little more encouraging is his ERA versus Milwaukee which is 1.80. The Brewers will be showcasing Chase Anderson who’s season ERA is an unimpressive 6.11, so far this season he has not started against the Chicago Cubs. While neither pitcher is the star of either team Hendricks has a clear advantage. Since last year these two ball clubs have met in 21 games out of which Chicago has won 16 and lost only 5. When you consider these head to head stats it makes it really difficult to think the Brewers have any real chance to beat the Cubs in this match. However, as I mentioned earlier the Cubs are coming from a loss while the Brewers won their last game against San Diego, so the momentum of each team has been influenced in opposite directions. Will this be enough to stop the Cubs who have been the hottest team in the League? Doubtful. The Cubs are the favorite in this game even though they are the visiting team, why is that? Just check the stats, the Cubbies have a 13-3 on the road record vs. the Brewers 10-11 home record. In this series history is on the side of the Cubs, they don’t even need to start their best pitcher to still have an advantage over Milwaukee. In my opinion the Cubs are the clear winner in this match up and to win the series as well. The loss on Sunday should only serve to fuel their competitive drive to try and break the longest championship drought in the history of the MLB. So to answer the question, is this the start of another winning streak? Hell yeah! So make sure to logon to your AceSportsbook.com account and make your wagers.